Rep. Matt Gaetz (R-FL) is tired of the fantasy world that socialist Democrats seem to be living in. History will judge harshly my Republican colleagues who deny the science of climate change. Similarly, those Democrats who would use climate change as a basis to regulate out of existence the American experience will face the harsh reality that their ideas will fail. 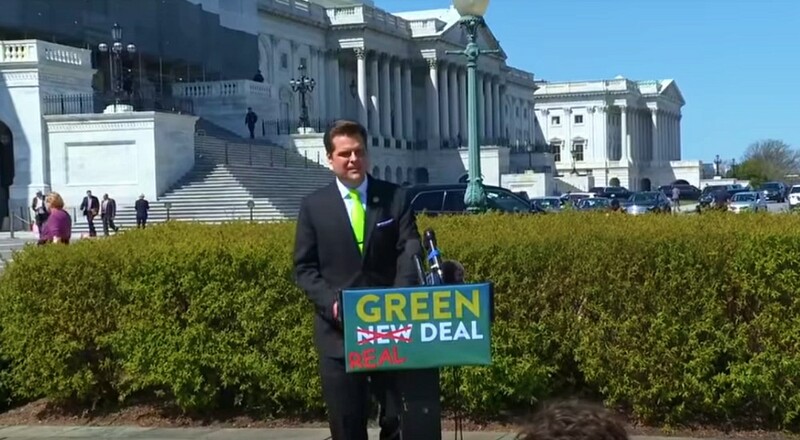 Today along with other members of Congress, I’ll be filing a Green Real Deal, a common sense rebuttal to the Green New Deal. The Green Real Deal rejects regulation as the driving force of reform, and instead unlocks the unlimited potential of American innovation and ingenuity. The question for America is pretty simple, either we want a bunch of bureaucrats in Washington telling us what we can’t do, or we empower American innovators to unlock things that we can do. Unilaterally disarming the American economy through crushing regulations will empower Washington but few others. Our rise in global leadership on climate must be fueled by American innovators and I have a plan to support them. Look, I’ll look for support anywhere I can take it. I was pitching these ideas to Ms. Ocasio-Cortez a few minutes ago, there are some that I think we agree on and some that we don’t. Right now we have a Congress that won’t even have a serious debate about the way to address climate change because we’ve got either focus on frivolous other attacks on the president or we’ve got too many Republicans who deny the science of climate change. The Banning of Guns and The Violation of our 2nd AmendmentCould this Really be the 'Biggest Deal Ever Made'?